Story County asks: Where do the Supervisor candidates stand? 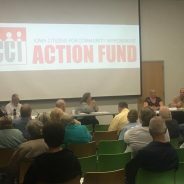 Over 50 members gathered November 1st at the Ames Public Library to ask the Story County Board of Supervisor candidates the tough questions on where they stand on our issues. The forum was attended by Lauris Olson and Scott Schaben (candidates for the four-year seat), as well as Martin Chitty and Linda Murken (candidates for the two-year seat). Members narrowed in on four main issues that directly impact the lives of residents across Story County. Check out this great piece from the Iowa State Daily which captures the play-by-play of our incredible people-powered event!